Suffice it to say that satire is alive and well in THE ADVENTURES OF UNEMPLOYED MAN. Erich Origen and Gan Golen have a political stance and they run with it from the very first page. 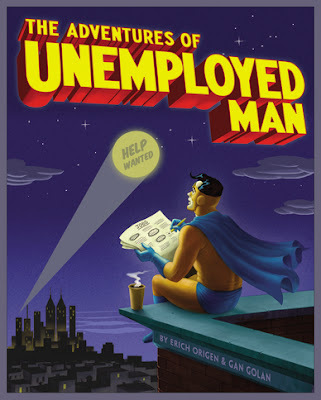 The story is about a superhero, Ultimatum (power: motivational speech), who is transformed into Unemployed Man when he loses his job and discovers the masses of people out of work. Unemployed Man then helps lead the people into revolution, overthrowing the capitalistic superheroes of wealth (led by The Invisible Hand). The book echoes all of the classic comic books of the past, but the message is underpinned with biting humor and a fearless look at the current state of economics, including elements that led to the recent financial meltdown. I found myself laughing at loud at the ways in which the writers used comic tropes to make political points, never pulling any punches. This is clearly a jab straight at the political right from the political left, and the book makes its points loudly and pointedly and with no apologies. It is a story sure to rile the conservatives. I’m not sure exactly where this book would fit. It is clearly designed for an older audience with knowledge of economics and politics. Understanding satire is an advanced skill (you should have seen the confusion on my young sons’ faces as they read this book). While not inappropriate in content, the story and theme leans so far left of center that to treat it as anything other than a political document would be an injustice of sorts. Not every realm of the world requires such balance, but I believe a classroom does. I imagine that an upper level high school political science class might be a good place for this book as well as a class exploring rhetoric or author's point of view. Mostly, it seems to me that this is a college-level example of satire and popular culture. Click here for the Unemployed Man website. I would highly recommend this book, with the caveat of finding the right audience. THE ADVENTURES OF UNEMPLOYED MAN does not belong in the elementary or middle school classroom, but it might have a place in some high school and university classrooms. There is no real violence or inappropriate language here. It just that the content is very sophisticated. When I thought about whom I would share THE ADVENTURES OF UNEMPLOYED MAN with, my thoughts ran to adult friends who are college professors and other political junkies in my circle of acquaintances. I couldn’t think of a single kid I’d pass this book along to.